Anna Zehler was born in Nuhweiler, Rhine Province, Prussia, and came to America in 1855, with her brother Michael. On February 9, 18641, she married Nicholas Kehl at St. Cecilia's Roman Catholic Church in Sheldon. Nicholas and Anna settled in Bennington, New York, where they raised their children. i. Helen Kehl Helen was born on February 28, 18661. She married George Beechler. ii. Susanna Kehl Susanna was born on March 15, 18681, and she died on September 13, 19702. Susanna remained single. iii. Clara Kehl Clara was born on January 4, 1871 1, and she died in 194613. Clara married Frank Sindecuse. iv. Jacob Peter Kehl Jacob was born on October 18, 18731, and he died on May 19, 19062.
v. Frances Kehl Frances was born on April 4, 18762, and she died on December 27, 195432. Frances married Gerhard Ziewers. 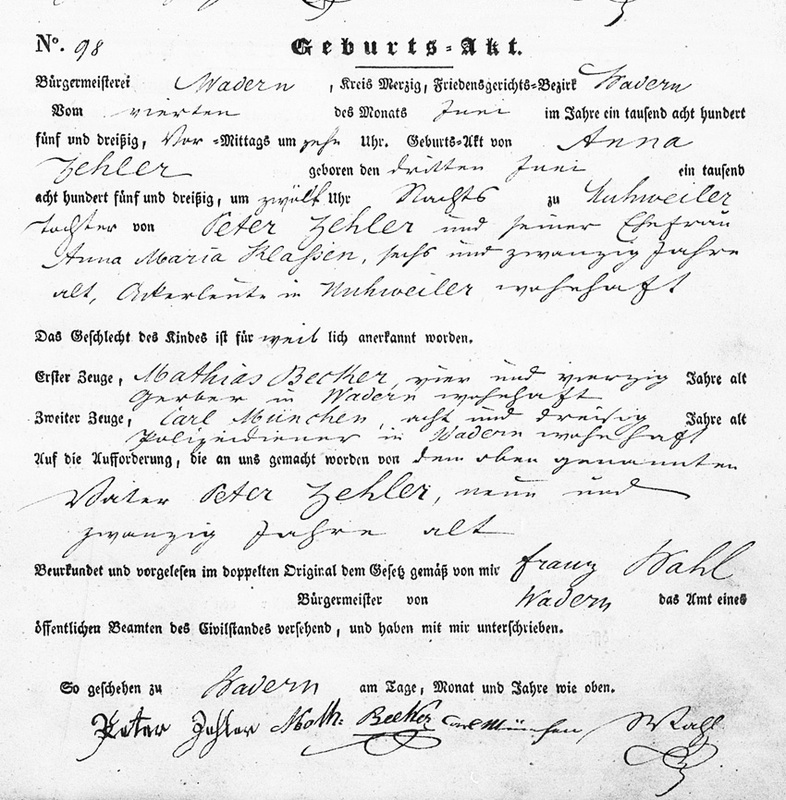 Anna Zehler was born June 4, 18355, in the tiny village of Nuhweiler, the third child of Peter Zehler and Anna Maria Klasen. We know little about Anna's life prior to her departure for America. The U.S. Census of 1900 shows that Anna came to America in 1855. This is confirmed by the passenger list of the Samuel M. Fox, shown at the left, which lists Anna, age 19, along with her brother Michael, age 17, as passengers. The Fox left from LeHavre on March 27, 185,5 and arrived at the Port of New York on April 21st, where it was towed into guarantine. The crossing took a relatively short time of 24 days. After arriving in America, Anna and Michael joined their brothers John and Peter in Orleans County, New York. The 1855 New York Census lists Anna as a servant living with Elijah Root in the Town of Murray24. Just as young men often hired out as farm laborers, young women often became household servants until they married. Our next glimpse into Anna's life comes when she married Nicholas Kehl on February 9, 18641, at St. Cecilia's Roman Catholic Church in Sheldon. Nicholas was born December 15, 183392, in Kostenbach, Rhine Province, Prussia, the son of Peter Kehl and Anna Loch. He came to America in 1852, and journeyed to Sheldon, New York. His parents and brother Peter came to America in 1855, and settled in Bennington, New York. Anna may have known Nicholas in Germany, since Kostenbach is only a few miles west of Nuhweiler, however, their relationship undoubted developed as members of the large German-American community centered on St. Cecilia's parish. Nicholas and Anna initially settled in Bennington, where Nicholas purchased a farm on Burroughs road, near the Sheldon town line23. This same farm was later owned by John Zehler. However, a year later, Nicholas purchased a farm in Sheldon23, and the family was living there at the time of the 1870 U.S. Census26. Finally, Nicholas purchased a third farm in 187423, this time back in Bennington, where he continued to live until his death on January 4, 19092. Subsequently, Anna moved to Bennington Center, where she lived with two of her grandsons, Walter and Claude Beechler. Anna died March 30, 19152. Both Nicholas and Anna are buried in the cemetery of Sacred Heart of Jesus Church in Bennington Center. Clara Kehl was born January 4, 18711, in the Town of Sheldon the third child of Nicholas Kehl and Anna Zehler. On May 26 18912, she married Frank A. Sindecuse at Sacred Heart of Jesus. Frank was born on October 1, 18631, the son of Adam Sindecuse and Anna Maria Kolb. 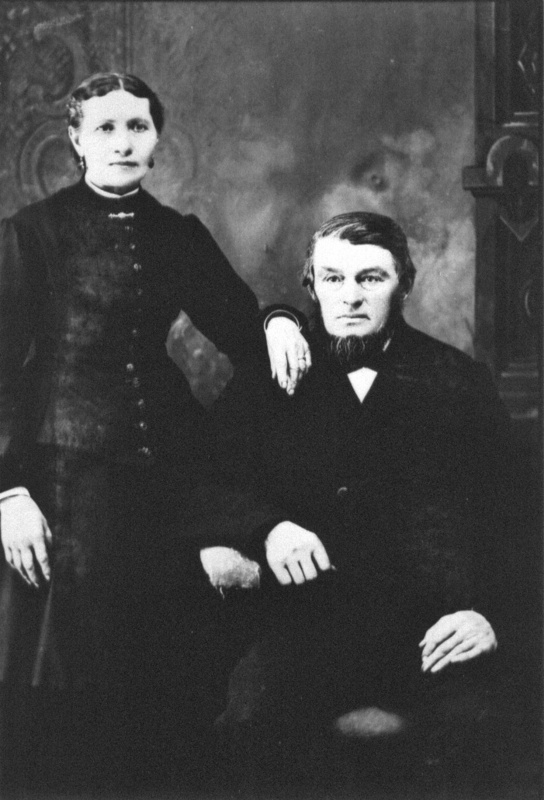 Frank and Clara initially settled in Bennington, where their child was born. In 1900, Frank's occupation is listed as a butcher33. However, by the early 1900's, the family had moved Buffalo, where Frank was employed as a traveling salesman for the Cary Safe Company34. The Buffalo newspaper of March 8, 1907, carried a headline story reporting a March 7th train accident at Saratoga Springs, New York, in which Frank was one of three fatalities70. According to Frank's probate record, Clara Sindecuse brought suit against the Delaware and Hudson Railroad, which was settled for the sum of $20,00034. Clara continued to live in Buffalo with her unmarried daughter until her death in 1946.
i. Blanche A. Sindecuse Blanche was born on December 28, 18972, and died April 7, 197634. Blanche remained single. Blanche Sindecuse was born December 28, 18972, in Bennington, New York, however, most of her life she lived in Buffalo. After the death of her father, Blanche lived with her mother until the latter's death in 1947. 1; Census data indicate that Blanche earned her living as a piano teacher77, 78. She died in Buffalo on April 7, 197634. 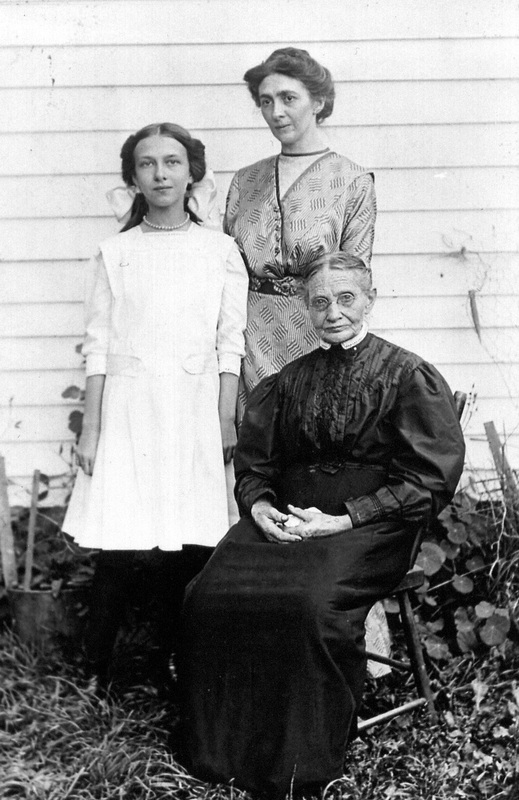 Frances Kehl was born on April 4, 18762, in Bennington, the youngest child of Nicholas and Anna Kehl. On February 13, 19022, she married Gerhard Ziewers. Gerhard was born on February 17, 18782, the son of John Ziewers and Barbara Meyer. The Ziewers family were members of the Sacred Heart of Jesus parish in Bennington, and operated the general store in Bennington Center. Following their marriage, Gerhard and Frances settled in Buffalo, New York, where Gerhard worked as a clerk71. In 1910 and 1920, Gerhard was working as a salesman for a bakery72,73. Then in 1930, he is working in the automotive industry79. In addition, he is listed in the 1914 City Directory as a partner in the firm of Beechler and Ziewers80, a grocery store he operated along with Frances' nephew, Walter Beechler. It would appear that Walter was largely responsible for operating the grocery store and that Gerhard and Frances provided capital to help set him up in business. Gerhard and Frances had one daughter, who married, but apparently had no children. After retirement, the Ziewers returned to Bennington. Gerhard died in the Warsaw hospital on October 26, 195474, and Frances died shortly thereafter, on December 30, 195475, at Gowanda, possibly at the state mental institution located there. Evelyn Ziewers was born in 190413, presumably in Buffalo, New York. About 1929, she married Allen C. Scharlock. Allen lived in Blasdell, New York, where worked as a salesman for a bakery. It is possible he met the Ziewers family through Gerhard, who also worked as a bakery salesman. After their marriage, Allen and Evelyn settled in Buffalo, where they lived with her parents. Evelyn died in 194713, and Allen died in 197213. Both are buried in the cemetery at Sacred Heart of Jesus in Bennington. They apparently had no children.